STORING high sample volumes in the minimum space is a challenge faced by many laboratories. Micronic now offers a new answer to this perennial dilemma with its 2.00ml storage tubes, which provide higher volume storage within an industry-standard 96-tube rack without compromising sample traceability. 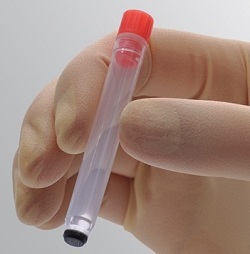 Organisations including biobanks, drug development and pharmaceutical research labs, and biotechnology companies will find these new tubes are the answer to their sample storage problems, says Micronic. Each tube is coded with a unique 2D code laser etched on the tube bottom to enable easy identification and traceable storage. The code identifies the sample, its coordinates within a storage rack, the identity of the particular rack, and the location of the rack in the freezer. Produced in a class 7 clean room from ultra-pure polypropylene, Micronic 2.00ml tubes are certified RNase and DNase free and non-toxic. Shaped to be easily gripped by a robotic arm, these tubes are designed to fit the industry-standard format 96-tube Roborack. This means that they can be loaded with standard 8- or 12-channel pipettes, and are compatible with automated liquid handling systems and other laboratory automation platforms. A choice of push cap or screw cap closures are available , although Micronic recommends its novel ‘single turn’ tube screw cap which it says stays securely in place even during repeated freeze/thaw cycles.